Dealing with termites can be a tricky business. They’re small, hidden, and extremely dangerous. Often, it takes a professional to identify, treat and restore the damage termites can cause. Unfortunately, that can add up to a very costly task. Size- A termite’s size is similar to an ant’s- which can make identification pretty confusing. Depending on their role in the colony, they range from 1/4 to 1/2 of an inch in length and can either have wings or not. Shape- When identifying a termite, the best rule of hand is to think in straight lines. Unlike ants, their bodies are the same width all the way down; they have straight antennae rather than bent; and both sets of wings, if present, are straight and the same size. Color- The color of a termite depends on their job. Ground-based workers may range from a translucent white, tan, or light brown color. Swarming termites, on the other hand, are typically dark brown or black. Termites are often known as the ‘silent destroyer’ because they invade under or inside the walls of your home and you won’t know they’re there until they’ve done significant damage. The termites you actually might encounter are the swarmers, or flying termites. These guys hang out around windows during mating season. They have two sets of wings of even lengths and, unlike flying ants, they shed their wings periodically. Call a professional immediately if you suspect swarmers or see wings under where they are swarming. Termite damage is 100% preventable. 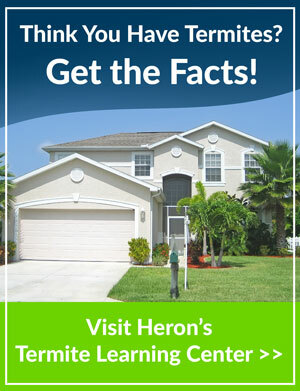 At Heron Home and Outdoor, we offer a method using Termidor®, America’s number one termite defense product. Once you’ve used our prevention services, you will be fully protected under a ten year, $1 million repair warranty. If you’re worried you may have a termite infestation, or feel you’re vulnerable to one in the future, call today for your free same day inspection at 1-877-772-0826 and get $100 off termite prevention with this coupon. Home » What Do Termites Look Like?